Clockwise from left: Clifton Duncan, Jonathan Fielding, Ashley Bryant, Akron Watson and Amelia McClain (Photo by Jeremy Daniel). The Play That Goes Wrong should be titled The Play That Goes Right. Oh, it’s understandable why authors Henry Lewis, Jonathan Sayer and Henry Shields came up with their title. Practically nothing the characters do in this play-within-a-play, now on Broadway, seems to be correct. That’s likely quite all right with many a theatergoer who has seen this wacky comic treat. Judging from a recent performance, the production is causing near-non-stop belly laughs. The British humor didn't appear to be lost on the American audience one bit. If this play-within-a-play were a pill, the FDA would be wise to approve its sale in large quantities at drug stores. If what they say about laughter working as medicine is true, seeing this show is good for you. Now, that’s not to say The Play That Goes Wrong is the mental equivalent of a full, nutritious meal that sticks to your bones. No, this show possesses the caloric equivalent of, say, cotton candy. There’s nothing in this slapstick-filled comedy that will exercise your mind’s ability to think, challenge, or provoke you in any way. This play’s intent is to allow escaping, for a couple hours, an existence that makes many of us want to throw our comforter over our heads for the day. A great cast succeeds in entertaining us due to deft comic timing. The play-within-the-play is a murder mystery farce. Therefore, we must get the sense that carefully choreographed, controlled chaos is taking place on stage. Fortunately, director Mark Bell has helped cast members achieve this illusion to near perfection. Spontaneity, synchronicity and sincerity are three more key ingredients to producing the kind of loud, sustaining laughs heard during the reviewed performance. Audience members were laughing so much and so loud that tears welled in their eyes. As one expects from a farce, the comedy is physical, amounting to slapstick. But it’s low comedy of the highest quality from the cast. Its members are working with United Kingdom-based Mischief Theatre, an Olivier-Award-Winning theater company. Its mission is “creating engaging and exciting, improvised and scripted comedy theater of an excellent standard through well-honed improvisational and comedic technique and strong theatrical ensemble work,” according to its website at http://mischieftheatre.co.uk. Mission accomplished with The Play That Goes Wrong. The actors know, for instance, just when to turn their heads in shock or surprise, raise an eyebrow or both, or suddenly betray a broad expression. The performers don’t anticipate in the least what action will follow. Again, it’s all very spontaneous. The Play That Goes Wrong centers on the Cornley University Drama Society, an amateurish, mistake-prone theatrical troop. They’re trying to stage a 1920s murder mystery farce titled Murder at Haversham Manor. Performers flub lines, splash liquor at each other, scream at the top of their lungs and get knocked unconscious. At least one performer swings like an acrobat from a lighting instrument dangling from the ceiling and scenery slams to the floor. You can probably rest assured that the performers sport bumps and bruises following each performance. So while the show is good for us to watch from a medicinal standpoint relating to laughing…the cast is probably racking up some minor first-aid bills. Nevertheless, these troopers seem ready and enthusiastic to bring us their brand of impeccably-timed comedic skills. The plot of the murder mystery, unlike many farces, is simple. A resident of Haversham Manor has been murdered. The action takes place on the evening of Charles and Florence’s engagement party during the winter of 1922. Expect the unexpected as Inspector Carter tries to solve the puzzle. Mark Evans plays the inspector with a no-nonsense, business-like demeanor. Evans doubles as a charming Chris Bean, the Cornley University Drama Society and director of The Murder at Haversham Manor. In addition to the slapstick featured in the murder mystery, things go awry as the drama society attempts to perform it. Lighting and sound operator Trevor Watson (an airheaded, goofy Akron Watson), must suffer from a form of A-D-D; he cannot seem to stay focused on the task at hand. Meanwhile, injuries to cast members force tech people to step into roles. They include stage manager Annie Twilloil (a befuddled Ashley Bryant). Annie’s no actress, so she can’t act with any feeling, much less inhabit a character. Alex Mandell plays company member Max Bennett who, in turn, portrays character Cecil Haversham. Mandall has a habit of laughing at his lines, which makes them sound less funny. The murder mystery’s played out on scenic designer Nigel Hook’s award-winning set. It provides plenty of space for the actors to engage in physical comedy without risking major injury. The set, complete with period details, looks so sturdy you have a hard time believing anything could go wrong. The set, of course, includes doors that slam. However, there are other surprising entrances and exits that performers use. Lighting designer Ric Mountjoy creates the desired affect when a piece of surprising information is revealed. The lights change color or intensity. The actors freeze, with broad expressions on their faces, in melodramatic fashion. 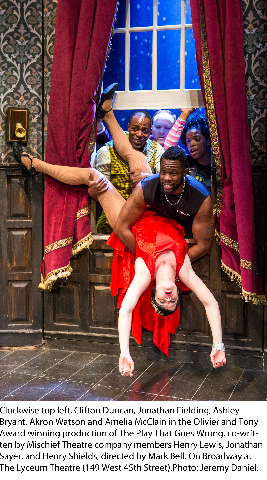 The Play that Goes Wrong will keep you riveted as the mystery unfolds. While you’re eyes are trained on the stage you’ll laugh til you drop.